This is what is left of my home office while awaiting its turn for transport across the state and eventual cleaning and storage. 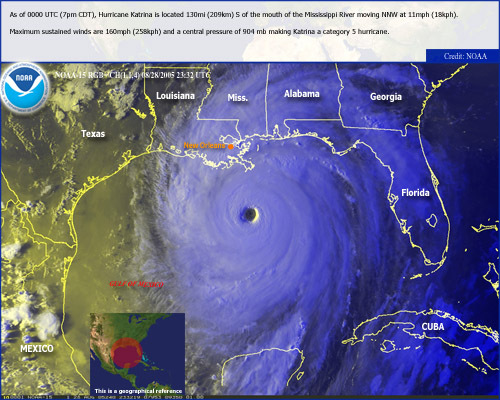 Image of Hurricane Katrina from August 28, 2005 bearing down on the Gulf Coast. You can listen about something terrible that happens. You can see something terrible that happens on TV. You can talk among friends and relatives about things that happen and all agree that it was really a bad situation. However, unless you experience something terrible firsthand, it is not the same. As a detached observer, you are watching things unfold, but you are protected from the reality of the event by time or distance and can express feelings for the people who are suffering. But, you still are detached and this makes all of the difference in the world. Such was the event that will be remembered and used as a gauge for future major storms. Hurricane Katrina. It has been dubbed "the worst disaster to hit this country". It was. On August 29, 2005, Hurricane Katrina hit the New Orleans area with devastating results. You would have had to be on the moon to not have seen the haunting images on TV unfold over the next few weeks. Watching the events unfold, one became awe struck by the haunting images of what Hurricane Katrina did to this metropolitan area. Since 1968, I had been living in the New Orleans area. Again, as many times previous, I got the "official word" to evacuate. The Saturday before the storm, I hurriedly left the city for an uncertain future. My wife and I had done this on many other occasions. On one such occasion, I had to take her out of the hospital to leave town. She was recovering from major surgery and we drove out of town accompanied by sheets of rain and tropical force winds. The officials closed the Causeway just after my car crossed the threshold of the bridge. We were heading north and away from the approaching storm. This time, Hurricane Katrina was bearing down on New Orleans. My gut feeling was that this one may as so many others had done, spare us the brunt of the damage. This, after being quickly upgraded to a major hurricane only hours before. In a span of an afternoon, I hurriedly prepared my house as best I could for the approaching storm. I loaded up what belongings I could into my small car. 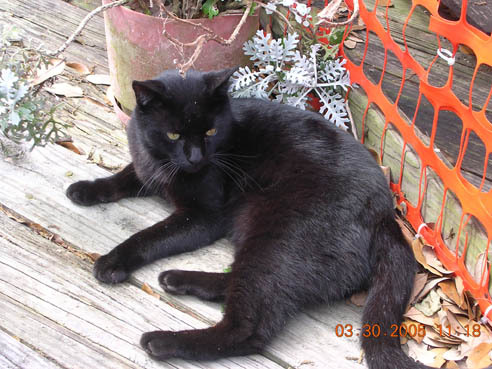 Then I said what I felt would be my final good bye's to our pets that I was unable to take with me and headed west, away from the approaching Katrina. This journey, though at the time largely uneventful, was but the prelude of things to come. The next couple of days were to change my family's life -- forever. From the relative safety of my in-law's home across the state, my wife and I watched the storm's slow progress across the Gulf of Mexico. The track would take the storm on a path somewhere near my home. I watched as the satellite images continued to show the storm's steady approach -- eventually to envelope the metropolitan area of New Orleans as well as the entire central Gulf Coast. This storm was massive. This storm scared me more than any other we had experienced thus far. The grave faces and tones of the officials appearing on TV only strengthened my feelings of dread. Now, for the next uncertain week, we watched TV and worried. We made phone calls, and worried. We got on the internet -- searched out information, and worried. No one really could provide specific answers to ours and the many thousands of evacuees questions. When could we return? To what were we returning? Had our homes been flooded out? Had a tornado (many were in the area supposedly) wiped my neighborhood off the map? We mainly saw that New Orleans had been severely damaged and the aftermath of the victims left behind in New Orleans burned lasting images into our minds. Had our area suffered the same fate? We did not know and information was slow to emerge, especially for what we needed to know. We heard rumors -- many, many rumors. We would just have to wait until the word to return was given and find out for ourselves what had happened to our home. An excruciatingly long week finally passed. Fear and apprehension accompanied us during each waking hour of those days. We had heard rumors of being allowed to return on this day or that day, but always the word we heard was incorrect. Eventually the word came out from the official channels and we could return on Labor Day. Labor Day, 2005, one week later, we were allowed to return for the day. 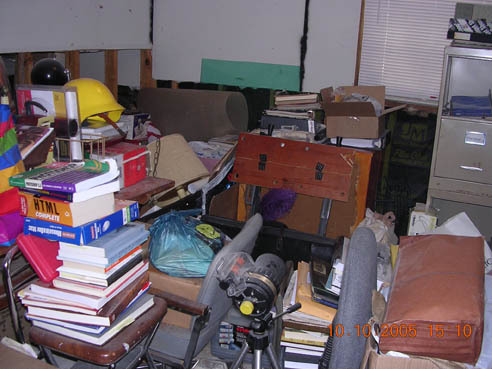 We would be allowed to check out our homes and to see if we could salvage any personal items. We were allowed until sundown that day to do what we could to secure our property, salvage what we could and leave town before the curfew began at sundown. We did not know what awaited us. Labor Day morning, and after a restless night, we were up at 3 a.m. and on the road an hour later. Our niece and her husband had offered to accompany us on our first trip back to the devastated zone. Between Eunice and Baton Rouge, traffic early that morning was fairly light. Approaching Baton Rouge, the traffic began to thicken and every time we passed an open gas station, you could see cars, trucks, vans and other assorted vehicles topping off their gas tanks before the final leg of their journey into the devastated areas. On the eastern side of Baton Rouge, traffic picked up in volume. Signs blinked along the roadway urging all evacuees to stay in the right lane and reserve the left lane for emergency vehicle traffic. In no time you could see why. Caravans of state police cruisers rushed pass, as did convoys of military vehicles, utility trucks, and many other assorted vehicles -- all with emergency lights flashing. This set the pattern for the remainder of the drive. It was still night and the sight of this caravan --which spanned both inbound lanes and in some cases the shoulder was interesting to watch. It was also a bit scary, thinking as to what must await us at the end of our journey. That was if the sight of these vehicles gave away a warning clue. We were in for a very full day indeed. Occasionally a helicopter sped by overhead headed towards New Orleans. From the throaty roar, lights and dimm markings, the suggestion was that they were military. Nearing the crossover of Interstate 10 and US 61 near Gonzales, the traffic began to slow down appreciably. In no time we were sitting in a traffic jam stretching for what appeared to be miles. Nothing but bright red brake lights could be seen into the distance. Again, this was another hint to what soon would be upon us. The state police were herding the traffic onto Airline Highway for the remainder of the drive into the disaster area. All traffic funneled into a single line while exiting the interstate. A brief period of highway speed quickly ended near Gramercy. Again the sight of stopped vehicles promised more delays to come. We had heard the evening before that because of the advance notice given by parish officials, that many residents had taken to the road early in anticipation of large volumes of traffic. Many had driven to the parish line the day before and waited out the night in lines...wanting to be among the first to be allowed back in. That line quickly extending a few miles back towards Baton Rouge. Heading now into the affected areas, we became bogged down in traffic once more -- the last 30 miles moving at a crawl. The voices on the radio repeatedly informed us that we would be passing checkpoints and in order for us to enter the area, had to show proof of residency. I attributed much of our long wait the final 30 miles to this mandated necessity. The scene was reminiscent of others we had seen on TV -- mainly of war zones. Cars, emergency vehicles, utility vehicles, military vehicles -- all bumper to bumper for as far as the eye could see. Helicopters were slowly flying overhead as if herding cattle to whatever fate awaited them. The only vehicles to move were the emergency vehicles -- being directed by state troopers around the stalled traffic. A few eager evacuees quickly joined this procession only to eventually be herded away from the lines of emergency vehicles. Incredibly, a couple of cars passed us on the shoulder, with young men appearing to be celebrating something -- all drinking and having a good time! Where had these fools been? The final 30 miles took us 5 hours to cover. An amusing moment that comes to mind was when my wife and our niece had to make a "nature call". We were alongside one of the many small "casino" gas stations. They both took off hoofing it to the place to return shortly afterwards. Their business completed -- we had not moved away from the front of the "casino". After leaving southwestern Louisiana at 4 in the morning, we arrived in our home town about noon. Approaching the first checkpoint area, we passed the airport with scenes of large military encampments, military traffic, and military helicopters taking off and landing continuously. We watched as huge air force cargo jets roared into the sky while others approached for landings. This was the current base of operations and we had seen some of the scenes on TV the previous days. It was vastly different seeing it in person while crawling in a continuous line of traffic. Driving the main thoroughfare, the sight of downed trees, power lines, heavily damaged buildings and the military standing on virtually every corner, reminded us that this was indeed real. This was not the same town I had left a mere week previous. Had it only been a week? Helicopters, flying about 500 feet above were seen headed back and forth towards downtown New Orleans. Military transports were taking off and landing with regularity. The military presence was everywhere with soldiers dressed in combat gear and brandishing automatic weapons. They were usually in the company of civilian policemen. The sight of automatic weapons within easy reach told me that the town I had left a week before was indeed NOT the same town anymore. The sight was sobering. The majority of the TV news networks had depicted many scenes such as this, and much worse -- especially in flooded New Orleans. We took in these sights -- but even seeing this on the screen of our TV across the state did little to prepare us for what we saw as we slowly drove through the streets of our home town. Sides of brick buildings had collapsed exposing the inner walls, trees everywhere uprooted or merely broken off cleanly at varying heights. Uprooted trees in some cases were huge and large gaping holes marked the spot where the tree had once stood. A couple of buildings were but blackened hulks, obviously from fires that had run amuck. No emergency services were available to respond nor was there any water pressure even if they could have responded. Some power lines were down or hastily repaired to make the road passable. Most homes we saw were generally left standing, but roofs were in various stages of damage ranging from a few shingles missing to entire sections of shingles missing. 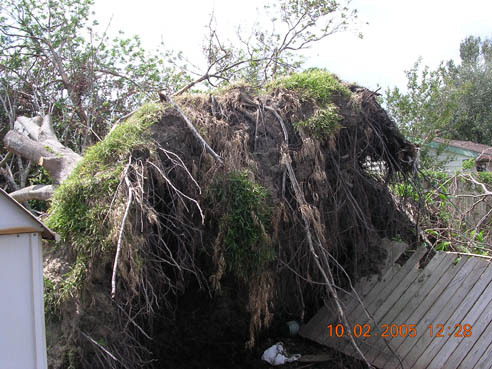 Some homes were damaged from falling trees while others faired better. Falling trees had dropped between houses, sparing them the indignity of a caved-in roof. Nearing our neighborhood, the damage continued to be evident -- ever present. The sight of trees downed everywhere met the eyes. It appeared that every tree had sustained damage to one degree or another. And this was not the most heavily damaged area. Large branches tossed about like children's toys littered virtually every yard. Water stood in small pools in depressions as well as low lying sidewalks. Otherwise, you could not tell that flood waters had covered this area a few days before. I had spent some time on the internet checking out the web site set up to inform residents who were planning to return. One site that was listed displayed satellite images taken shortly after the passage of the hurricane. I located a few images in the area where my house was. Narrowing down the search, I located an image depicting my neighborhood. Enlarging it, I zeroed in on my house. It appeared to be still standing and from what I could see from the extreme height of the image, my roof appeared intact with no water in my yard and little other damage depicted. Something odd appeared in my back yard, but I could not put my finger on it, but it did not look right. The extreme height that the image had been taken revealed little detail. I could still see my small red car in the playground parking lot across the street from my house. It was as I had left it -- or so the picture gave the impression. As we approached my street, I became more apprehensive. Up until then we had talked mainly about the sights of OTHER houses, buildings, streets, etc. Now my house would come into view and this sight would be forever etched into my memory. Downed fences, trees and damaged houses were everywhere. Hundreds of roofing shingles littered yards and the streets. In some cases, we had to make our way through streets littered with tree debris and hastily chopped up trees. Turning the corner, I could see my house. It appeared almost untouched! We had finally arrived. The yard was a mess, with many broken branches strewn about, trash everywhere; our wood fence in shambles -- the gate still standing, but oddly protecting nothing behind it. The fence was down on the ground from the gate to the next property line. Outwardly, our house was relatively intact. Our house as we saw it on our first trip in. This shot was taken as we drove up and before we even went inside. The boards had indeed protected our windows, but what waited inside, even they could not protect against. Entering the house, the first thing that we noticed in the darkened interior was the smell. The stench of sewerage and mold. Our home had received about 3 feet of brackish lake water, mixed with drainage ditch water and foul smelling sewerage water. The water had apparently entered under the doors, and seeped in under the walls. With the water being confined, it rose rapidly to a height of about 3 feet in most of the house. Apparently after the rushing waters outside had reached a certain level, the waters inside had begun to recede and had settled to a level of about a foot. This apparently lasted long enough to leave a distinct waterline along the walls. I am certain of the height reached by the water originally in my house. This is because of the piece of furniture in our living room holding my TV, stereo, and DVD player also held another item. On the same shelf that the TV sat -- rested our son's bronzed baby shoes. While picking up the treasured possession, the tiny shoes spilled a noxious concoction of water that had been deposited by the rising flood waters. Cautiously entering the house with a flashlight in hand, the first thing that caught my wife's eye were two black streaks running for the safety of the rear of the house. These streaks were Randy and Urchin, our two cats left behind in my hasty departure. Incredibly, they were ALIVE after spending nine days in temperatures that reached above 100 degrees, rising water and stinking humidity. The inside of the house felt like a sauna...hot, humid, wet floors reeking of the stench of raw sewerage. If you have ever had the opportunity to smell raw sewerage, you have a distinct idea as to the smell within my house. However, in addition to this stench was an even more unpleasant odor. The smell of mold. It is difficult to describe this smell, but it irritated the eyes, the sinuses and caused sneezing fits. The closest I can come to describing it was once when I was in a swamp. The smell was that of decay. 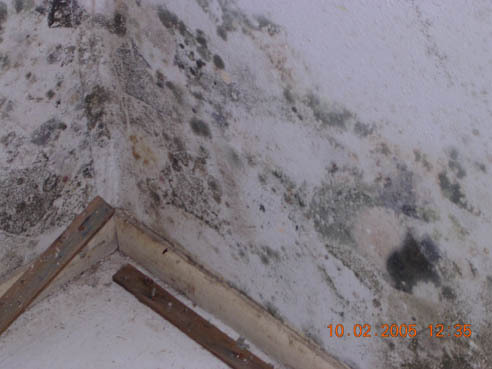 After a week of being enclosed -- lacking sunlight, mold was forming everywhere along the lower walls. The floors were slippery with whatever had been seeping into our house. In our dining room, a small compact refrigerator had been opened by the inrush of waters. The contents had been spewed out nearby. A couple of bottles of beer lay haphazardly on the floor. Somehow the thought of having a cold beer at that moment did not seem appealing to me. 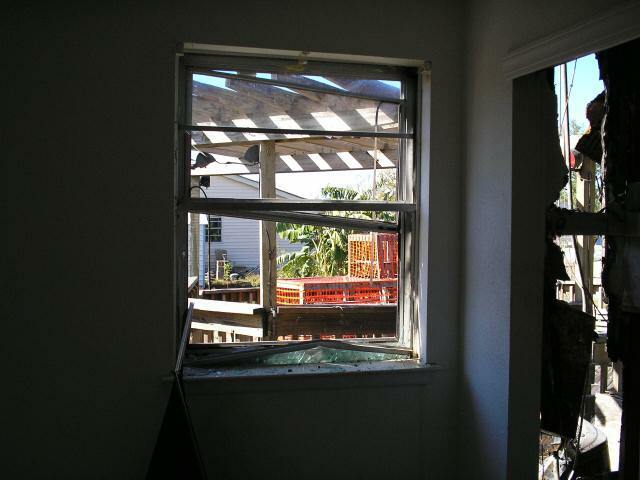 Prior to the mandatory evacuation, I had boarded up the windows. These were in place to help protect from flying debris. Multi colored mold in one of our bedrooms. Image taken on one of our later trips after the carpets had been pulled up. Mold in the house eventually reached to a height of about 3 to 4 feet. The stuff smelled NASTY and you never could get it out of your sinuses when in the place. The smell marks your sensory memory, much as the smell of a skunk does. Just looking at this image brings that horrible smell back! One of our first tasks was to rescue the two family pets. This took some doing. We were able to corner the first cat almost right away. Into a pet carrier she went, followed by fresh water and food. She was understandably scared and dehydrated. The Urchin voiced her opinion many times over during this long day. I had left bowls of food and water around the house before leaving. To this day I cannot recall the exact locations that I had placed their "emergency rations", but apparently I had been at least partially successful. My wife later told me that the food and water that had been placed in the bath tub had survived and had not been mixed with the sewerage water. Some of the water and food had been contaminated, as I suspected. In the utility room, the cats had even managed to overturn the storage container spewing the remaining food unto the floor. This was now a smelly unrecognizable mess. We did not locate the second black cat, Randy, until we were almost ready to leave. She had had the reputation of being a cat who avoided human contact whenever possible, even before the storm. Eventually after carefully checking each nook and cranny in the dark house, we ended up locating a very terrified Randy. She had crawled under the narrow gap under our bedroom dresser. She was wide eyed and scared to death, but otherwise unhurt. My wife and I had worried about our cat's fate for the entire week as we waited for our officials to allow us to return home. We could only imagine the fate that these two animals endured during the passage of this monstrous storm. The howling winds, the torrential rains and the sounds of debris hitting the house must have terrified the pets beyond their capabilities to comprehend. This was only the beginning of what must have been an ordeal born in hell for these and thousands of abandoned pets. As the storm left the area towards the northeast, the rains eventually began to subside. Winds were still probably topping 50 mph in gusts and squalls. Incredibly, some of the neighbors had remained in the subdivision, choosing to weather the storm instead of leaving as so many others had done. One resident living across the street and down the block chose not to leave. As the winds began to taper off and the rains slackened, he ventured out to the playground across the street from my house. There, he happened to look back towards his house. To his horror he saw a wall of water approaching him! Caught unawares, he had ventured out of the protection of his house and was now in danger of being trapped away from his home. He quickly headed back to the relative safety of his house, only to met by the fast approaching waters. At first the water reached to his ankles and quickly rose to his knees. Before gaining the safety of his house, the water continued to rise higher. Briefly, he felt trapped. He fought the onrushing waters and managed to reached his house, quickly heading inside. This relative safety was short lived, for the water began to seep under his door. He could do nothing as the water crept inside of his house. He could see the waters rushing down the street, spilling over into the yards and then into the houses. The waters reached my corner. The waters kept heading down the streets while continuing to rise and eventually spilling into the boarded-up house. From the front of the house, the waters continued to spill into the yard and eventually filled the back yard. Inside our lawn building, the high water mark was clearly marked about halfway up our barbecue grill. The local news eventually aired some footage taken of a parking lot in our town that showed the effects of the rising waters. My wife watched the footage while taking a break from our work. She had gone to our neighbor's house and the footage happened to appear while she was there. Two of our cats, Urchin (top) and Randy, at home in their new temporary home. These two were the black streaks that were observed running for cover when we finally were allowed to enter our home again. The cats, all of them, had required attention occasionally before the storm changed our lives. Since the events of August 29, 2005, they require love and affection on a much more regular schedule. The rescue of our pets was not as dramatic as ones shown on TV. These depicted the rescue of pets in flooded New Orleans and St. Bernard Parish. Even so, to us, this rescue meant a great deal to us. Our pets had survived! They had managed to beat the odds and because of that, we now have our pets back with us. It took time for the effects of the storm to ease from their memory; but with our affection and caring, they made a speedy recovery from their ordeal. One of the cats took a month to come out of hiding in her new home when anyone was present. This same cat had slept at my feet each night before the storm changed our lives. "Pisser the cat." Here he is next to the "kitty condo" on one of the happier days at our home before the hurricane season began. On our third trip back, at least a month following the storm, the last of our pets walked up to us! 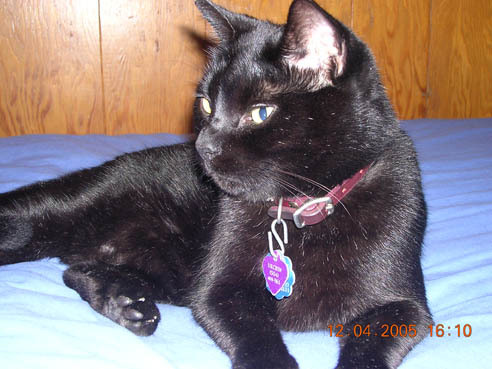 He was the latest edition to our household and an outside cat. This was due to his repeated habit of "marking" everything in his path. We could never break him of this habit and thus he only came inside for brief visits, some gentle attention and a hearty meal. That day, as we were preparing to begin our long day's activities, he came walking up, obviously well fed -- in good spirits and proceeded to drop down at my feet purring loudly. Where had he weathered the storm? What was his story? Weeks later on a subsequent trip, my wife visited with the neighbors a few houses down the block. They told us that he had showed up shortly after the storm looking for a handout! They fed him on a regular basis while we were gone, not knowing whose cat he was. Preparing to leave that day for our long return trip, I grabbed a box, cut holes for him to see, and brought the last member of "our family" home. 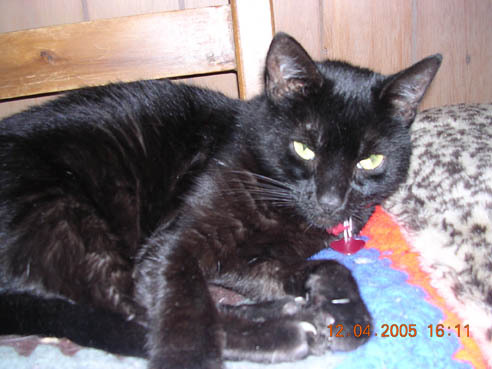 To this day, rain and thunderstorms, cause much anxiety to our cats. On this first trip home, however, time now was our enemy. 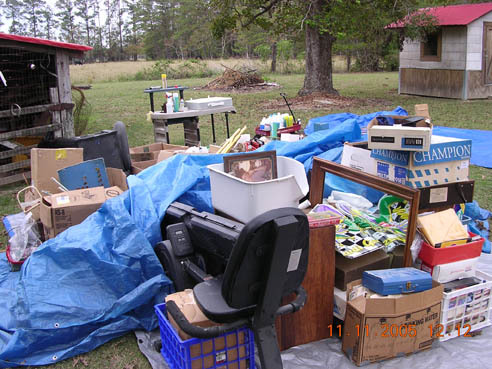 While in the house, we spent as much time as possible collecting what we could, throwing the items into large garbage bags and pitching these onto a trailer we had brought with us and then filling the pick-up with what we also could salvage. Nearing our deadline to leave, I took what photos I could to document the damage for the upcoming insurance claim. The drive back was filled with many thoughts of what would happen next. The future was now terrifying, muddled -- uncertain. Over the coming weeks, we made another six trips back home to pick up our hopefully salvageable possessions, clean up what could be cleaned and to dump the countless items damaged by the rising waters along the curb. Small mountains of similar items appeared along the curbs of virtually every house in the area. Combined with large piles of debris, the streets took on an eerie appearance reminiscent of the bombed out streets depicted of war torn Europe. Piles of debris, trees, branches, furniture and appliances lined each street. Appliances were common sights, with refrigerators, freezers being especially sad sights. Compounding their appearance on the curbs were quickly scribbled notes on many of them stating: "Do NOT pick up -- NO insurance!" Most were put out after being wound with strips of duct tape. The tape served two purposes. One was hopefully to keep small children from crawling into them. The second purpose was the main reason. No one wanted to open them, for inside was a toxic combination of foods that had been sitting in the tropical heat of the houses. If you could catch a whiff of the smell, you did not want to again. The reek of rotting food was unmistakable. Those same appliances sat on the curb side for weeks until FEMA eventually arrived with heavy equipment and work crews to take them away for disposal. Our debris piles were eventually removed on about our fifth trip in mid October. We happened to arrive just after the debris was picked up. The crews had moved on down the street. Debris littered the curbside in front of my house. The photo was taken on one of the later trips as work had been progressing on removal of the damage inside of the house. Many items that had only received minor water damage had to be pitched...porous materials trapped the toxins that were prevalent in the water that had come into the houses. Clean up of the mess would take months. Over many weeks, and trying times, we slowly began to clean up the aftermath left by the storm. We began the painfully slow process of putting our lives back together. We were among the luckier victims of Hurricane Katrina. We had had flood insurance along with our regular insurance policy. We began the long uphill battle of contacting the insurance company, filing claims, getting in contact with FEMA and eventually the Red Cross. Much of the process took weeks of long distance phone calls and many hours of phone conversations that followed interminable waiting periods of "holding" to speak to someone. Countless calls to relatives, friends, utility companies, services, cleanup companies, tree removal companies, contractors, appliance stores, and the many other daily needs took time, patience and its toll on us. Tempers grew short. Depression was a daily visitor. Doing this from across the state proved an especially daunting task! Things moved at a snail pace. We had no way of knowing just how long this snail pace would continue. Typical of what I would gather from the fellow who I eventually got to gut the inside of my house and then rebuild it, was that help was hard to find and keep. Larger companies would offer much more for experienced and eager workers. FEMA was grabbing up as many able bodied men as they could for debris clean up and street clearing. Supplies -- common ordinary building supplies were in extreme short supply. As one place told him, he had to be there waiting at the order desk when the next truck arrived with sheet rock or he would not be able to get any...first come...first served. The contractor's original estimate of 4 weeks to gut and rebuild my house has dragged on to three plus months. Still the house remains unfinished. Who is faulted with the delay? It is impossible to really say. We were in southwest Louisiana for about three weeks when yet another massive storm entered the Gulf and threatened south Louisiana. Rita eventually crashed ashore at the Louisiana/Texas border leveling the same area that had once been leveled by another storm -- Audrey in 1957. In the country where we were now staying, winds from this second storm topped 90 mph in gusts. These strong winds combined with horizontal sheets of driving rain. It took time for things to recover from this second storm. These delays affected our slow progress back in New Orleans. It would seem that a simple phone call could be easy to make. But with both storms coming within three weeks of each other, a long distance call could be next to impossible. The "800" phone numbers, especially helpful in normal times, became a nightmare during the weeks following these two storms. Invariably, you would get messages that the call could not go through or if you were lucky enough to get through, you received recorded messages telling you that their system was "overwhelmed" and to please call back later. Many a night, I was up at the wee hours of the early morning, on hold -- waiting for my turn to reach a critical service. The second storm following on the heels of Katrina only added to this frustration. Even simple services became major obstacles to overcome. FEMA was helpful in granting us money towards living expenses as they had to many other displaced people from the New Orleans area. We were fortunate to be able to have a place to live -- a bedroom in a relative's house in the country. Countless others were not as lucky...having to live in shelters or motel rooms for weeks on end. Early on the morning of November 16, I received a call. It was from FEMA. Incredibly, they were calling to finally offer me a trailer! I was a bit astounded at this call. Even though I did not express it, I was thinking that it surely would have been nice to make that offer back in September when I really needed it! I declined their kind offer suggesting that they instead offer the shelter of this trailer to the many folks back on the Coast who still had no place to live. Still to this day, I keep receipts of each purchase and dutifully log the receipts. I then send copies off to FEMA at the end of each month. I must show that I am still waiting for my house to be completed and again be livable. The insurance company was helpful on our claim. To me the time elapsing between the original claim and the forthcoming checks seemed slow. But looking back, it appears that they handled my claim in a timely fashion. Flood insurance is expensive and is required in areas that flood easily. This is a requirement by mortgage companies and the premiums are steep. The coverage is LESS than most regular insurance policies pay for home owner coverage. 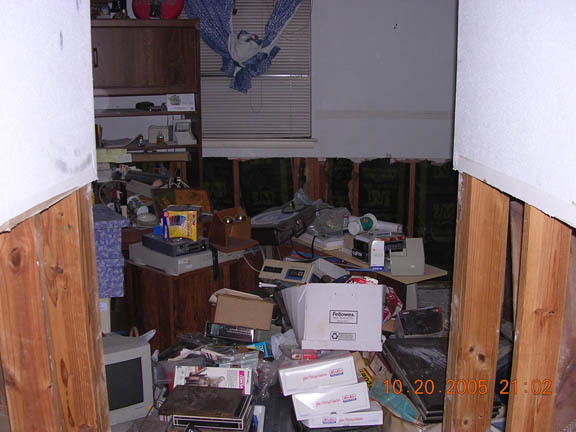 You have the usual deductibles and flood insurance does not cover all of your losses. They have set amounts for what they will pay and is expensive -- if you can afford it. Home insurance policies do NOT pay for flood damage. That is why folks who live in areas that have the potential to flood, must carry flood coverage. Since the disaster of Hurricane Katrina, much debate has been taking place about the subsidizing of flood insurance for people who live in these flood prone areas. I guess that we were lucky in that we had a flood protection policy. Much of our damage would not have been covered by the home owner's policy, but was covered up to an extent by our separate flood policy. The flood policy does not pay for out of pocket expenses when displaced by a catastrophe such as a hurricane. 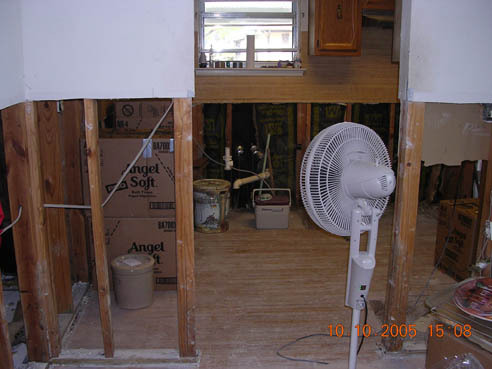 Most home owner's policies have such a clause, but NOT for flood damage. So, the insurance company agreed to give us a small advance on our claim -- chargeable back to our final settlement. Again, we were luckier than many others. On occasion when my wife became depressed about our ongoing situation, I have attempted to assure her that we were among the lucky ones. Here, we had home owner's insurance, flood insurance, and a place to stay . We were healthy, and so were our "family" of cats. We were very lucky. She agreed. But the events of August 29th took away our many hard years of labor building our lives. Now we were headed into our retirement years. It did not matter that we were "luckier than others", for the intense pain that we felt was very real. We now were faced with a major clean up job, rebuilding, relocating -- not to mention starting our lives over! Yes, we were lucky, indeed. The wheels of progress have moved interminably slow. Days passed into weeks and the waiting game continues. The real breaks in routine -- if you can call them that -- were the trips back home to remove our salvagable possessions. Our contractor kept urging us to clear out all of our belongings. He suggested a portable storage unit that he had seen appearing in drive ways around the area. The problem was that they were as all other service -- tapped out. A spot on a waiting list of over 1,000 households was all that I was able to obtain from the company. This was BEFORE the second storm hit south Louisiana. Permanent storage units around south Louisiana quickly filled up and these became next to impossible to locate. If you could locate one, it may have been small and would not accommodate all of your surviving belongings. In many cases, these units were NOT climate controlled. This meant that your furniture, clothing, etc. would be sitting in a metal building, under the late summer sun in our well known Louisiana humidity. Eventually I found a place to store our belongings near where I was staying. We began getting our "salvageable items" transported across the state. A couple of friends were kind enough to help us with the use of their pick-up trucks and an open trailer. Even so the number of trips continued to grow. At one point, we even rented trucks from a couple of nearby rental places to make repeated trips home to remove our posessions from the stinking place that we had once called home. We quickly found out that these places for renting trucks were equally overtaxed and overbooked. I had asked a brother living out west to come in for a week to assist us in one of these ventures. The only truck available for miles around had been rented by someone who was doing what we were doing, returning to New Orleans to get out what they could salvage. The problem was that they found out, as we had, that one trip was not enough. They continued making daily trips until they had finished cleaning out their house. We eventually located another truck and managed to make a trip gathering a load of moldy smelling belongings. It was interesting to note that on each trip back to the New Orleans area, we saw a couple of rental trucks broken down. They were all the same company and this company's main repair depot was located in -- New Orleans. Each trip required that we leave long before dawn and drive the 170 or so miles to New Orleans, load up what we could and leave to return that evening sometimes late into the night. After a few quick hours of sleep, we were up the next morning and we quickly off loaded the belongings. Then begin the time consuming process of disinfecting each and every item that was brought out of the house. One of the saddest losses was when I check in the living room in the cabinet that housed the TV, stereo, DVD player, etc. In the storage area below the TV was my record collection spanning about 20 years from 1962. All were ruined, welded together by the stinking sewerage that had entered the cabinet. Many records were early recordings of the Beatles, the Rolling Stones, Peter and Gordon, Simon and Garfunkle, many Oldies but Goodies albums and the list went on. In all, about 230 albums (not including record sets) were contained in this cabinet. I will never be able to replace them. Typical of the mess in each room as the trips back home produced. In order for the construction crew to do any work, either we had to move items around, allowing them access to walls, etc. or they moved things around. Either way, the result was a mess and items from one room ended up in a different room. Items here were basically from the office I used to work on my web pages. One of the later trips to collect personal belongings. The vinyl floor was still in place then. 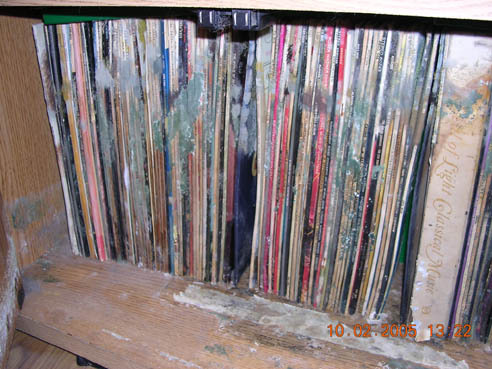 It also had to pulled out and proved to be a daunting task with men having to scrap away pieces of vinyl strips. This particular view is what had been our kitchen as seen from the dining room. 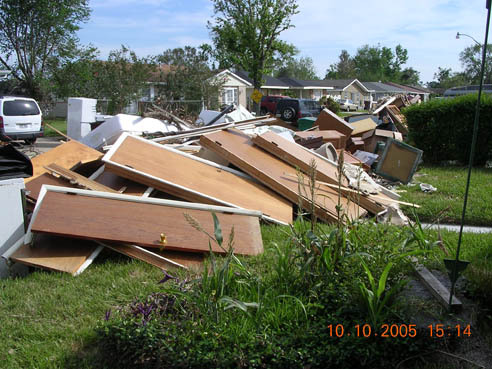 Typical cleanup process for belonging brought back from New Orleans. Tarps were the order of the day. Everything was removed from the trailer, or truck and placed on a large tarp. Then batches of cleaning solution were mixed up...bleach and water, ammonia and water, disinfectant spray and good old fashioned elbow grease. A typical trip such as this would require about a week to process if the weather held. On one of the last in the series of trips back to New Orleans, the piles of belongings remained outside, under tarps for almost a week. The rains came and much of the items cleaned got soaked, thus causing more "junk" to be discarded. Eventually the remaining items were put into storage. Even various methods of disinfecting offered limited results. Time could be our enemy and the mold could reappear, rendering the item -- junk. We still continued with this laborious process eventually cleaning out the remaining items in our former house. As I stated earlier, we suffered water damage up to about 3 feet inside of the house. Outside, we had branches in the yard, our wood fence lay for the most part in ruins. The yard was littered with debris. We had lost shingles on one section of our roof. Our utility shed was moved off of its foundation. A couple of small trees were down and a huge oak tree was uprooted, dropping down into the adjoining neighbor's yards. When it fell, it knocked down a wood storage building as well as sections of fencing. The gaping hole left by the uprooted root ball resembled a bomb crater. Short of this, we were fairly intact...compared to others. The large oak tree that was knocked down in the southwest corner of our property. The root ball measured at least 20 feet across and the hole appeared to be almost 5 feet deep. This image was taken on the third trip. The neighbor next door had already been at work cutting back the smaller branches of the tree in his yard. He eventually had the tree cut back to about 10 feet off the ground level, or what had been the ground level. The root ball settled back into the hole...partially and still sits mostly out of the hole and at about an angle of 75 degrees. As of this writing I am still trying to get this thing taken away. It will require heavy equipment to do the job and I understand it will be an expensive process to remove. Part of the downed fence and smaller trees in my back yard near the deck. Two thirds of the fence was down and the remainder will need to be taken down in order to replace it. As of late December, we still await the finishing of the ongoing work in our house and much of the outside work still remains undone. On our final trip to collect items, we found the walls again intact and prepared for coats of paint. The painting was to be followed by the trim work including new kitchen cabinets, doors, and wall trim. This would be followed by new flooring throughout the house. It will take time to heal our "wounds and scars", but life does go on and our lives are ever so slowly being rebuilt. These days, the news of Hurricane Katrina has been relegated to the inside of the newspapers, buried among other mundane stories. Most of what I see on TV seems to be the "placing of the blame for the disaster". TV still occasionally shows what is happening in the New Orleans area, concentrating on the harder hit areas. Even though our damage pales in comparison to the many thousands of residents who lost virtually everything, our loss is very personal to us, and hurts no less. For the last few years, I had been making tentative plans to eventually relocate to southwest Louisiana. Hurricane Ivan of last September, along with the horrific destructive forces of Hurricane Katrina have pushed up those plans by a couple of years. Maybe, just maybe Hurricane Katrina was a message being sent to us about living in an area that is BELOW sea level. The message was heard, LOUD and CLEAR. My wife and have no plans to return to the New Orleans area. Over the past 38 years, dodging numerous hurricanes and tropical storms, has left a deep, indelible mark on us. A feeling of dred would come over me each time one of those monsters entered the Gulf. Here we go again! Storm dodging became a part of life in New Orleans. I worked in newspaper advertising for some 21 years. Eventually, one of my unofficial jobs in the office building was that of "weatherman". I had acquired large hurricane tracking charts, devised numerous methods of plotting each storm from it's formation to the last throws of the dying storm. Each summer and fall, the tracking chart was filled with small colorful pins denoting the latest coordinates of the storm along with the current category and the latest track. My tracking chart was the spot to visit on one's breaks during the season, for it was my job to make sure the latest information was plotted. Eventually, I gathered the many completed tracking charts and donated them to a local college library. When our house and property are restored, we will rebuild in the country, near the community that we both grew up in. We are slowly getting on with our lives. 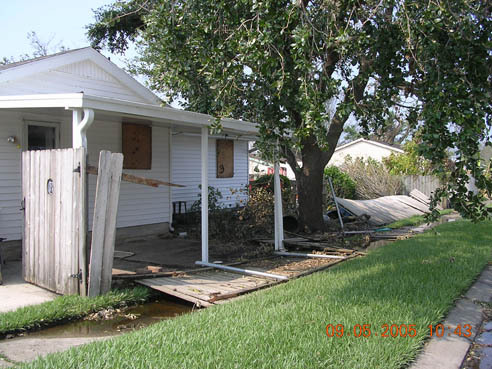 It will take us months, if not years to fully recover, if we ever fully recover from the effects of Hurricane Katrina. To use a very old and much overused cliché, "Each journey begins with a single step". We have taken the first step. Alas, we were among the lucky ones. Does one's luck change for the better? Or do things sometime go from bad to worse? The time for our house repairs was slowly drawing to a close. We were looking forward to finally meeting with our contractor and handing him the final payment for "completed repairs". We were even looking forward to a joyous Christmas in the county. For the last twelve years, I had worked each Christmas in an industry that was commonly called the "hospitality industry" and Christmas was a big work day. This year, I would be off and could relax, enjoy the holidays with family and friends. It was to be an exciting time for my wife and I. Christmas was to us the most special time of the year. Early on Christmas morning our lives again were turned upside down and all our dreams again dashed. At 3:15 a.m., the phone rang. My wife picked it up. I heard the phone ringing and figured that it would be bad news...probably a family member having an accident or worse. The phone rang twice more shortly thereafter. My wife did not tell me the news until morning. We had family in and I was sleeping in a different part of the house. When I got up in the morning, the family was sitting quietly in the kitchen talking in murmurs. I asked what had the calls been about. My wife told me to sit down for she had bad news. The police had called and told her that the house had caught fire. The fire had caused extensive damage. 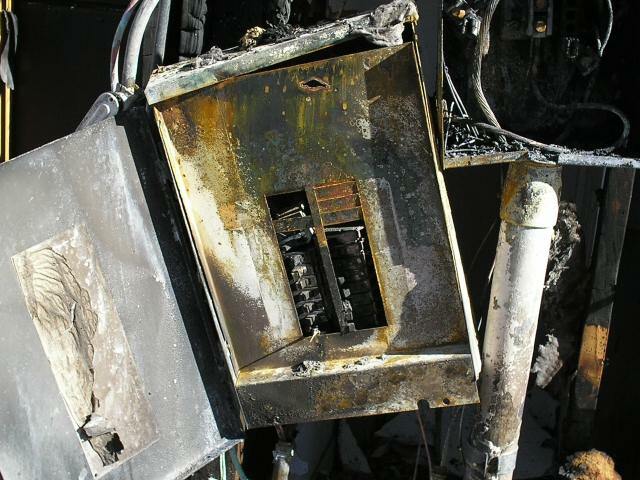 The fire department had also called to let us know that it appeared to be an accident and that it appeared to have started in the breaker panel on the rear of the house. The next door neighbor had also called to pass on additional details of the early morning Christmas fire. A wave of shock enveloped me. Surely this was all a big mistake -- a tragic mistake and I was dreaming. As things turned out, it was no mistake. The house had indeed caught fire and incurred extensive damage to the rear of the house, the attic also had received fire, smoke and water damage as well. 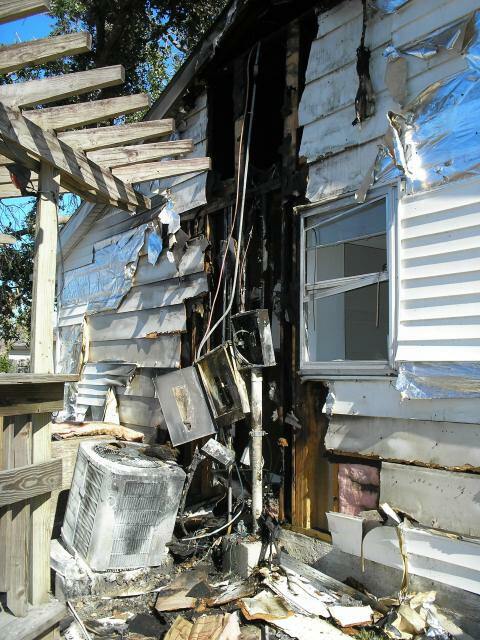 An image of the fire damage to the rear of the house which sustained the worst damage. A view from the master bedroom looking through the closet, through the wall. 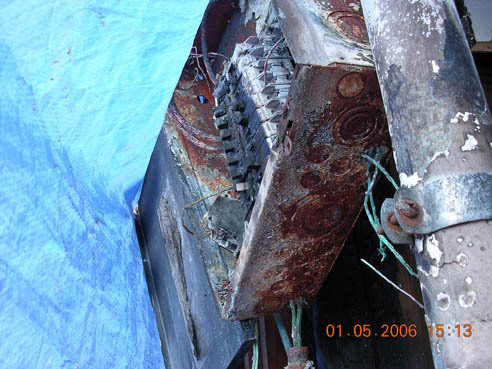 The breaker panel can be seen. 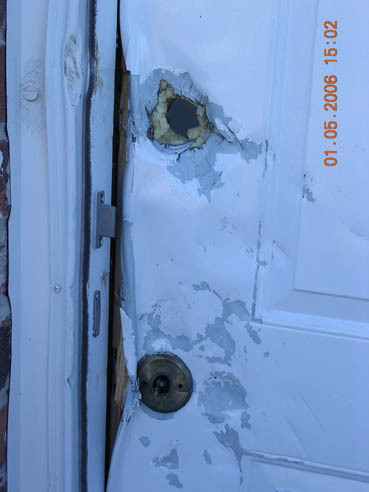 The main entry door where the firemen entered the house. The key was too late in coming. All of the work that had gone into the house over the preceding weeks was now rendered a waste -- or so it appeared this early Christmas morning. Later in the morning, I received another call. My contractor had received word and was on his way to the house to inspect the damage and see what steps were needed to secure the property and begin preparations to once more rebuild. He called me later when he got there and walked me through the inspection of the house. The front entrance door was severely damaged by the firemen as they entered the building. The interior was in surprisingly good shape except for the two rear bedrooms where the fire had started. Water damage to the ceilings extended into three of the four bedrooms. The attic was charred and the roof would need again to be replaced or repaired -- at least the rear half of the roof. The back wall had a large hole extending from the slab line all the way to the roof and into the attic where the fire had spread. Images of some of the damage inside of the attic. The fire damaged about 1/3 of the attic and roof decking. 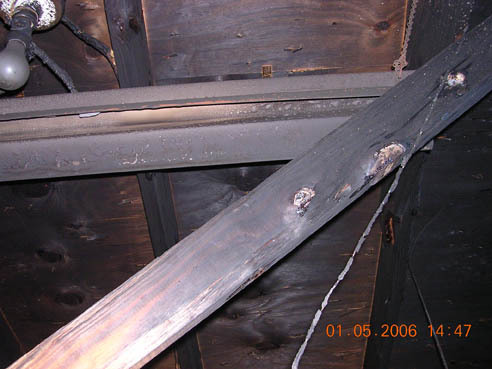 The attic had received extensive fire damage and a large portion of the wiring was now charged and burnt down to the bare metal. 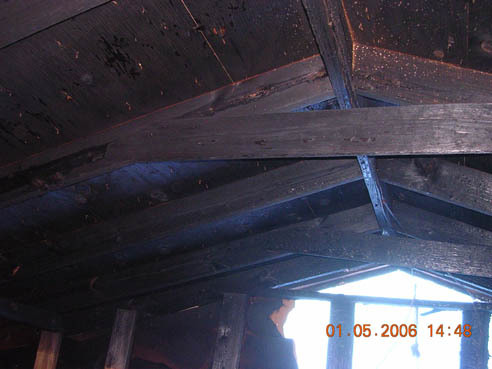 The roof decking was burned and so were the rafters. A section of air conditioning venting was charred as well as the lighting in the attic and the attic ventilator. On the rear wall of the house the hole was very evident. You could also see right through the walls of the closet in one of the back bedrooms. 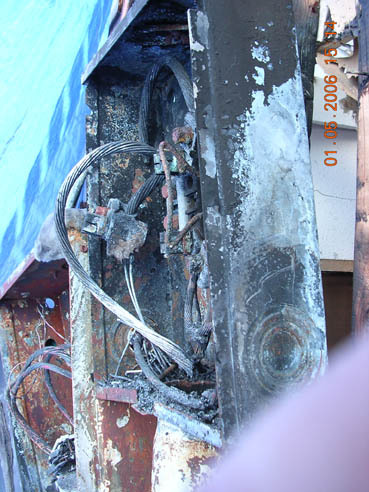 Views of the breaker panel showing the intensity of the fire which destroyed it. Views of the meter pan destroyed by the fire. 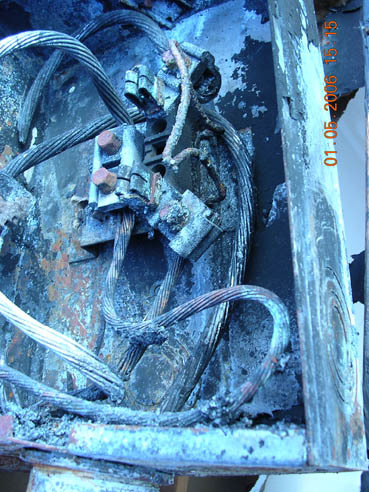 The breaker panel (only five years old) was a mess along with the meter box. The fire was its most intense here. What had caused the breakers to fail? The house had been rewired and inspected -- each outlet, switch, box, etc. only four years before. A few days later, we went to meet with our contractor and insurance adjuster to inspect the damage and formulate a plan for repairs. My wife and I were sick with the sight of our almost completed house. The images we saw were a shock to us. Even though the contractor said that the repairs were not going to be as extensive as he originally thought, they would take a couple of more months at least. Our plans of finally putting Hurricane Katrina and its aftermath behind us were once more dashed. Now instead of a renovated house awaiting us for Christmas, we now were being faced with more months of renovation and repairs. While talking to our contractor, he mentioned that he had talked to some other contractors over the course of the house repairs. One thing that came out of these convesations was interesting, to say the least. Contractors were working on houses and then out of the blue, one would erupt into flames! for no apparent reason. Aftermath of the hurricane or what. Strange! Looking back and trying to put the pain, tears and anger behind us, my wife and I are again grateful for one thing. We have considered ourselves lucky. If the house had been completed and someone had been there that early Christmas morning, the outcome could have been much, much worse. An anonymous phone call had alerted the police and fire department almost as soon as the fire broke out. The police and fire department responded quickly and were able to contain the fire before it had a chance to spread completely though out the house. This quick response saved the bulk of the work that had been done the preceding months and also saved the structure. An interesting thing occured about 4 years before. The night was Christmas Eve and the location was across the street from my house. The house there was decorated with a large amount of Christmas lighting. For some reason, that evening, Christmas Eve, the house burst into flames and ended up being a total loss! The fire department was not able to save the structure. This fire was but one of about four in the same sub division over a period of a few years. These fires prompted us to redo our wiring in the hopes of preventing just what happened to our house. 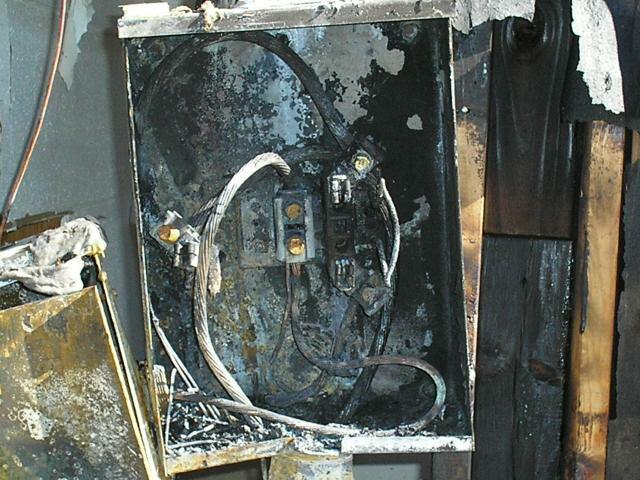 Our electrical panel was also replaced within that timeframe. Apparently the rewiring effort was not a total success. Something happened and our house now must again be repaired. We had planned to put our house on the market when the repairs were complete. Had this been done and someone had moved into the house, the results could have been much more different. Again, we were very lucky. This has given us some solace in our daily attempt to again rebuild our lives. So, now we continue to stay in the country, as guests of our family and we again attempt to put our lives back on track...one small step at a time. As the year 2006 began and moved forward, we began to look to the future. The house continued to be there in Kenner, with the contractor and his sub contractors working when and where they could to get the repairs completed. Many, many delays put the project on what seemed like a never ending cycle of a little work being completed and then things coming to a full stop. Problems with local rules and regulations, city inspectors, utilities, materials and labor continued for month after month into the new year. Eventually, the light at the end of the tunnel began to glow, faintly a first, but eventually over months, it grew and eventually looked as though the nightmare that had begun so terribly on August 29th, 2005 would all finally be over. 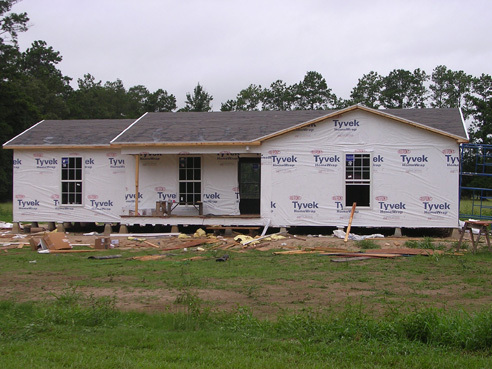 On the first of June, we made another of our many trips (in a rented vehicle, thank you) back to Kenner to do the final inspection of the house before writing the last of a long series of checks to the contractor. We had gotten word that the house was to be ready or nearly so about this time with a couple of loose ends to tie up. A couple of weeks before, we had asked a friend who worked as a real estate agent to begin listing our house for sale. We wanted to sell the house and not again move back to the area around New Orleans. We had run away from our last hurricane in that area of the state. We had a potential buyer when we made this particular trip. The deal fell through and once again our hopes sank. We approved the house repairs and returned to the country with the hopes of getting another potential buyer soon. Our real estate agent eventually located another buyer (after a couple of more aborted tries) and we were setting a closing date in late June. We were getting excited and hoping for a good sale to go through. As before, just prior to the sale, some paperwork hang-up caused yet another delay. The days now dragged by and our hopes with them. Meanwhile back in the country, we had begun the process of starting anew months before with our purchasing an acre of pasture land on family property in the country. We spent time and money preparing the land for a house. There were obstacles such as a health permit, a building permit, the local energy company who had to come out and run about 300 feet of power poles to the property, moving water meters from the location where my driveway would be. Preparing the land, killing the weeks, clearing the land of vegetation, plowing the land, preparing the access road/driveway which extended some 300 feet from the road to our proposed house pad. We then had to level the land, add dirt where necessary, slope the property so it would drain, and add three culverts for access from the road and across drainage ditches on the property. Then load after load of dirt had to be hauled in to build the house pad. The pad is pretty much what it sounds like. It is a pile of hard packed dirt/clay combination that resembles a foot or more in height of an outcropping that is elevated above the level of the ground. It encompasses the entire footprint of the house that is to be built on it. We also had to get an approval for a potential house loan from the local bank, in the event we could not sell our house in Kenner. This process dragged on and on with us getting so very near to selling the house and then once more the deal falling through due to one hang up after another. The bank held the application open for us and approved it with no problem. The builder worked with us in allowing us to begin the preparations without a fully secured loan. This would have been unheard of back in Kenner. Anyway, we also had to make sure the legal aspect of things were taken care of and the proper paperwork was acquired to obtain ownership for the acre of land and the right of way needed for us to build our access drive way across our sister-in-laws property. This work of course, required the services of a local attorney. After an exasperating 20 days of delay, the paperwork hang up in Kenner was overcome and the act of sale set. We again rented a car and began yet another long day on the road back to New Orleans for what was hoped to be a final sale of the property in Kenner. More paperwork hang ups awaited us on our arrival and we had to wait around and wait around while a computer glitch was fixed. The entire day passed with nothing being accomplished. We had to again come back a few days later when the paperwork hang up was finally taken care of. So a few days later, again we set off in the hopes of finalizing the sale of our house and freeing ourselves of the burden of a house across the state. This time things went off without a hitch and we finally walked away from the headaches of the long months following the hurricane that had changed out lives forever. We were now headed back to a new life of living in the country. During the many months following the ravages of Hurricane Katrina, both my wife and I had had many sleepless nights, depressing days combined with countless phone calls and a routine that began each day with "I wonder what this day will bring?" You have to experience these traumatic events in order to understand just what it is like to go through this major upheaval in a life. No written words can convey the countless "highs and lows" that someone experiences and the many nights of waking in the middle of the night wondering how you will cope with yet the next major obstacle that is now facing you. People call it "post traumatic shock" and it is most certainly real. We lived it for months following the storm and not a night has gone by without either my wife or I waking with nightmares and the frustration of yet one more problem to be solved. This went on nightly since the storm and will probably go on for the rest of our lives. We are now attempting to rebuild our shattered lives. We are taking it one day at a time, and are now looking forward to finally once again having a home to call our own. 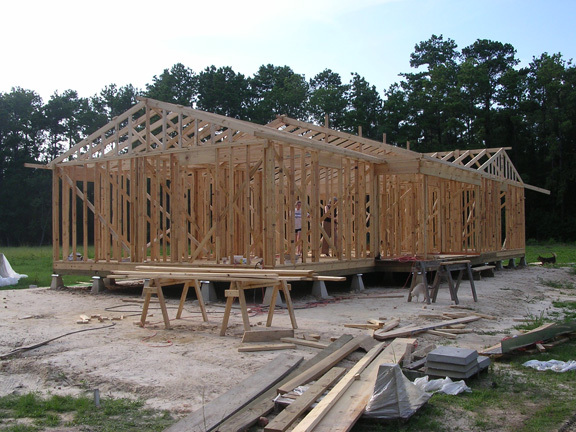 We have begun the building of our new house and we now feel free of a tremendous burden. With luck, we will be in the new house by mid October, fully 14 months since Hurricane Katrina first shattered our lives. Life goes on -- one small step at a time -- and there is life after Hurricane Katrina. 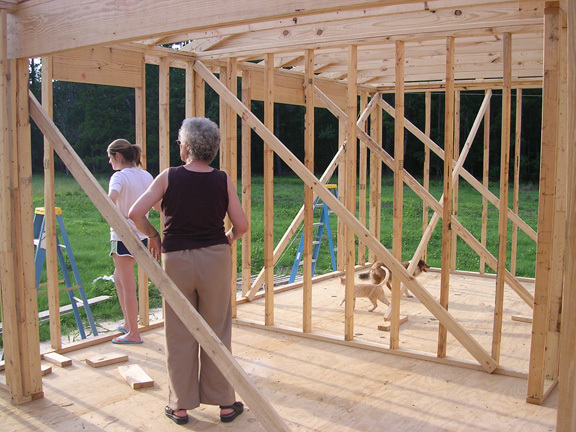 "Sue's Castle"... July 2006, the new house is beginning to take shape. About a week later, and the house is beginning to look like a house, at least on the outside. The inside is but a shell still. 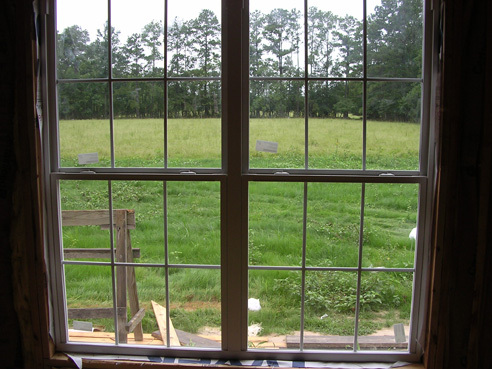 My double window in my "office" where I will continue to work on my web pages and my art. The view will include some cows, some horses and an occasional wolf or bobcat which frequent these parts. Even though the preceeding story was not war related, it represented the past eleven grueling months of our lives. 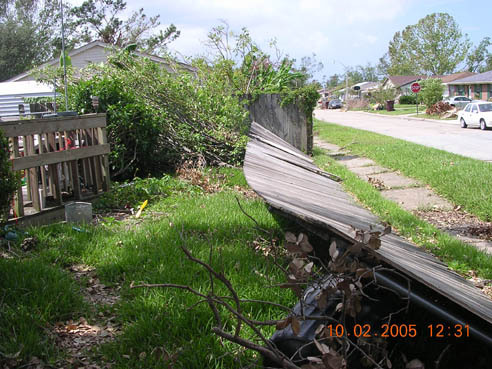 Many folks have asked me to tell them of our experiences and the effects of Hurricane Katrina on our lives. Hurricane Katrina and the resulting months of agony have left both my wife and I changed. These changes will stay daily with us for many years to come. We were so very close to having the house repaired and to have the house catch fire on early Christmas morning was a severe blow which continues to leave us reeling.